Advancing in an organization is often a top priority for leaders, but a narrow organizational and personal perspective can severely limit your ability to advance. 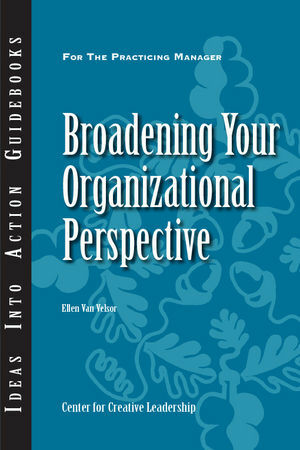 Broadening your organizational perspective—understanding not just your own area of expertise, but how your organization works as a whole-can greatly enhance your ability to move upward. This guidebook will help you understand how to widen your perspective by showing you what obstacles may be holding you back, and what challenges and experiences you can learn from in order to advance. Ellen Van Velsor is a senior fellow at the Center for Creative Leadership in Greensboro, North Carolina. She is coeditor of the third edition of The Center for Creative Leadership Handbook of Leadership Development and coauthor of Breaking the Glass Ceiling: Can Women Reach the Top of America's Largest Corporations? She earned a B.A. in sociology from Stony Brook University and an M.A. and Ph.D. in sociology from the University of Florida.